The campus of Wake Forest University in Winston-Salem is the final stop for ATP player that are looking to pick up a few wins in the run-up to the final major of the year. In 2016, the tournament was even named as the '250 Tournament of the Year' in the ATP awards. However, the first main draw match of the 2017 edition has garnered attention for an entirely unwanted reason. The match was between the Ukrainian former world #13, Alexandr Dolgopolov, and the Brazilian Thiago Monteiro. Monteiro was playing in his eighth hard court match at this level and was still looking for his first ATP main draw win on the surface. Alexandr Dolgopolov was coming off qualifying in Cincinnati, where he beat the in-form Kevin Anderson before losing to Nick Kyrgios. 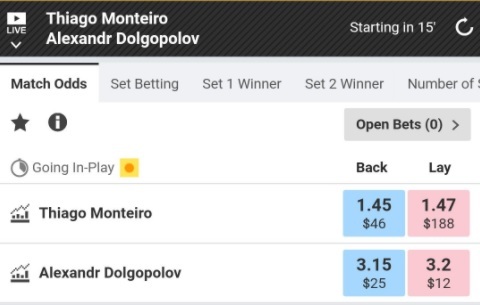 The opening odds with Pinnacle had the Ukrainian as the 1.36 favourite, implying a 73.5% chance of winning the match, while Monteiro was priced at 3.28, a 30.5% chance (the 104% total is due to the overround applied by bookmakers). The odds remained steady from their opening price shortly after 1pm on Saturday afternoon (all times are UK time) until around 6:20pm on Sunday evening, just under two hours before the match was due to begin. The next 20 minutes would see Dolgopolov's price at Pinnacle drift dramatically, reaching 1.63 at 6:40pm from 1.37. At this point, Pinnacle would remove betting on the match, signifying that they were seeing something untoward in the market. Bet365, a major UK bookmaker, would continue offering the match up until 7:34pm, by which time, the price on Dolgopolov had drifted further, reaching a price of 2.37, implying just a 42.2% chance of winning the match. Coral, another UK bookmaker, offered it until 7:39pm, stopping their market once the price had reached 2.50, a 40.0% chance of winning. The drift did not stop there as Dolgopolov's price continued to rise on the Betfair Exchange. We can see that 15 minutes before the start of the match, the prices had almost flipped entirely from the initial starting price, with Dolgopolov available to back at a price of 3.15, implying just a 31.7% chance of winning the match, compared to his initial 73.5% chance. At this stage, we were still 15 minutes away from the players even going onto court. As the match started, plenty of tennis traders and followers had noticed the highly unusual odds movements and were watching streams of the match. Several bookmakers had decided to not even offer the match at all, which is unusual for an ATP match on the main show court. When he was broken in the fourth game of the match following back-to-back double faults, Bet365 decided that they did not trust the match and removed betting on the first set and slashed the limits for what could be staked on the match. We're possibly witnessing the most obvious match fix of all time. Dolgopolov not hiding this very well at all. Extremely suspicious ground stroke errors, no injury and betting patterns all over the board. Dolgo with one of the most blatant fixes that I can remember seeing. By the end of the match, Dolgopolov had not created a single break point chance on the Monteiro serve. In the past two season, there have been just two matches where Dolgopolov has not created a single break point chance - at the 2016 Australian Open and Wimbledon 2017, both against Roger Federer. It is the first time in Monteiro's entire career that he has not faced a single break point on a hard court. In his previous 7 hard court matches at ATP level, he had been broken no fewer than 31 times. Now, it is true that Dolgopolov did have some strapping just above his ankle, which could have signified some form of injury. However, he did also have that strapping on last week and it did not seem to affect him then. Even if it was a more serious issue, one has to wonder how anyone found out less than two hours before the match and was so confident that it was serious enough to push his price from 1.37 out to 3.15. That sort of move is almost unprecedented and, in this scenario, suggests that someone knew of an injury so severe that it almost certainly meant that Dolgopolov had very little chance of winning the match. And that they only found out this information less than two hours before the start. An alternative is that the match was fixed. It would take relatively significant money to move the Pinnacle market by such a significant margin and for them to decide to take the market down. The fact that every major bookmaker decided to suspend betting before the match started indicates strong suspicions among those companies that are able to see the bets being placed. The fact that several decided to not offer the match in-running only emphasises this fact. From the outside, it is very difficult to determine what precisely has happened. However, what we can say is that the odds movements on this match are hugely suspicious. There are very few believable explanations for what might cause movements such as this and to this magnitude. It is important to note that there is no indication that Thiago Monteiro had any knowledge of anything that was occurring during the match. 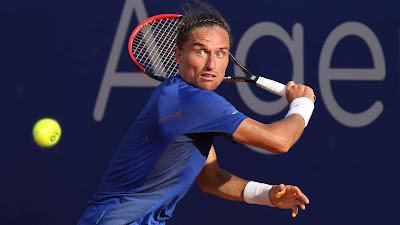 However, while there may be a valid explanation for what happened, it is impossible to deny that there are questions that need to be asked of Alexandr Dolgopolov. Over the past 18 months, there have been a number of grand statements from the tennis authorities and the Tennis Integrity Unit about tackling the problem of fixing in tennis. If they are seriously about living up to those statements, then this is a match that they should be taking a very close look at. The TIU has said that it does not regard unusual betting patterns as an indication of corruption. However, to ignore them completely is to disregard one of the clearest indications of something amiss. Lol kid you have no right to talk if you don't even watch the sport. I guess everyone would really like to see such an analysis. I would be great if you could post it. The writer has more than likely read far too much into this and the explanation could be simple: Dolgopolov's recent calf/ankle injury (see Wimbledon for example) has reappeared with his time on hard courts in recent weeks and someone noticed him with more taping than normal, or warming up differently in the morning. Bookies always have people out watching the practice courts and even something like the player massaging their recent injury during a sit-down or after practicing is enough to spark an odds change. Even more than that if a physio is seen taping a player or tells someone they did so. Maligning Dolgopolov based on this match, which I have watched now, is pretty poor form. He put in more effort than Tomic puts in in half of his match, and as much as Kyrgios does in half a dozen of his matches a year. Maybe he just played poorly because he was hurting. Anyone heard of Occam's Razor? If he had resented from that injury, he would not worsen it by playing this match and risk not being healthy for the US Open. It's not an explanation, I know, but an expected and simple decision given the circumstances. 'Bookies always have people watching the practice courts'. Nonsense. Most firms don't even have traders watching matches on TV, virtually everything is done via database modelling and risk management. Someone watching a court does not flip a market on its own. And the ultimate gauge of whether this was bent or not comes from the source of the money flow, which the TIU will undoubtedly ask for. If he was so disabled , he should have called in sick. Has he no respect for the sport? Thank you for writing this up. I was watching the match on a live stream and it was such an obvious fix - he made no effort to disguise it! In the first set Dolgo served two double faults at 30-30 to get himself broken and whenever he looked like he might break his opponent, he hit some wild wild shots. Towards the end he barely made an effort at all against a player whom he is superior to on a hard court, as reflected in the "true odds" the day before the match. The ATP Tennis Integrity Unit should investigate this or they will have zero credibility. and your point is? Money flows are the biggest determinant of fixing. Your 'evidence' is nothing more than natural variation. Without any evidence that the match was manipulated and betting fluctuations back that up, you're just moaning. Tennis players very valuable according to me because they use a lot of energy in this game. We consider that sports mania is very easy game in which players do not use much energy but I think, they use a lot of their energy during the match.